We’ve all been there: poor, hungry, and strapped for time. Don’t you just wish your home was a fast food restaurant? Well, it could be. Or at least sort of. One of the advantages your average fast food place has on you is a deep fryer. It’s fast, it makes the food for you, and it’s very expensive. But even without a deep fryer, you can deep fry stuff at home. These are recipes you can prepare in advance then freeze for a quick meal. The most time consuming thing is heating the oil. Here’s the classic – fries. All you have to do is chop up potatoes and throw them in the heated oil. Wait 15-ish minutes until they’re golden brown. Drain on a plate with a paper towel and use the paper towel to toss them around a bit after sprinkling some salt on them. You can also make fries with sweet potatoes / yams, carrots, turnips, or virtually any root vegetable. This one requires a bit of prep work. You need wonton wrappers and cream cheese. Cut up the cream cheese into cubes. Use your finger to rub water along the wraper’s inner outline. Fold your wrapper around it in half, diagonally, then fold the edges into ridges. Throw them in the freezer and they’ll keep for a week or more. To cook, throw them in heated oil for 3-5 minutes or until golden brown (or darker if you’d like them really crunchy). One way to keep the oil clear as you’re frying is to throw a baby carrot or chopped up carrot piece in there. One way to know if your oil is hot enough when using a pot is to look for crinkles in the oil. If you don’t understand what I mean, wait for it. You’ll see them. Put in just enough oil to cover, but stay clear of the brim of your pot. You don’t want to get splashed with hot oil. In case your oil does splash out of the pot, and you’re using an open element, and it starts a minor fire – don’t use water to put it out. Stay calm and move your pot to a cool element. close your element, cover the fire with a pot lid. Once it’s out, you can turn the element back on and continue cooking. Deep frying uses a lot of oil, but you don’t have to lose the oil you use. You can save your oil for next time if you let it cool and then pour it into a container. So long as the oil is fairly clean, you can use it a couple more times. As a vegetarian, it can be hard to entertain guests with food. Now, one thing in particular makes this difficult for me: I have a lot of friends with food allergies. As such, I have gotten to know and compile many recipes for different allergies. Cut the onions into cubes and fry with the oil. Grate the zucchinis and squeeze out as much liquid as you can. Mix together all the ingredients except for the bread crumbs. Spread the bread crumbs evenly over the bottom of a casserole dish. Put the mixture over the breadcrumbs and level it out. 6. Bake in the oven for 40 minutes at 355 degrees. Let it rest after taking it out. It will be hard to cut right away. Don’t worry – it’s meant to be that moist. This casserole is good both hot or cold. It’s reheatable if needed. Cut the spaghetti squash in half, carve out the middle gunk, and lay on a baking sheet. Put into the oven at 375 degrees for 45 minutes. Let the halves cool, then scrape the insides out with a fork. If it’s too hard to scrape off, put back in the oven for another 10-15 minutes. Mix the spaghetti squash strands with the marinara sauce, cottage cheese, and half the mozzarella cheese. Pour mixture into a greased 9×13 pan and sprinkle with the rest of the mozzarella and cheddar cheese over the top. Bake at 400 degrees until the cheese melts and begins to brown around the edges. Melt butter in a pan and stir in the flour, salt and pepper until smooth; gradually adding milk. Bring it to a boil and cook for 2 minutes, stirring until thickened. Remove from heat and stir in the cheese until well blended. Place half of the potatoes in a 1-1/2-qt. baking dish coated with cooking spray, then layer with half of the cheese sauce. Uncover; then continue baking another 10-15 minutes, or until bubbly and potatoes are tender. Every anime lover has had a moment of wanting to eat alongside their favourite characters.This compilation of Japanese recipes you can make at home makes it possible. These recipes are not my own and are not used for the sake of profit, just for the use of spreading the deliciousness. Have fun making these and enjoy them alongside your favourite characters. Put a scoop of cooled cooked rice in the middle of a sheet of plastic wrap and wrap it up. Hold the wrapped up rice in your hand, and cup your hand so it looks like a “U”, then cup your other hand, perpendicularly, on top of it tightly. Gently squeeze the rice into a triangle, then rotate the rice ball in your hands, so a different point is pointing downward and repeat. If you want to add a filling, sometime near the end of forming the onigiri, press a dent in the middle of rice with your thumb. Add your filling, and cover the hole with more rice, and continue forming. Take the rice out of the plastic wrap and form it a few times with your bare hands. Place it on a plate and sprinkle some salt on them. Cut up the nori. It can be large enough to cover the entire onigiri, or a small little rectangle for just on the bottom, or some cute shapes, etc. In addition to the salt, you can sprinkle some sesame seeds or furikake on top, and press it into the rice. This can be made on a small grill or in the oven. Just heat your oven up to a low heat, brush some soy sauce onto one side of the onigiri, place it on a cookie sheet, and put it in the oven. In 10-20 minutes, flip the onigiri over, and brush some more soy sauce onto the other side, and cook it again. Just keep an eye on it, and cook it until it’s slightly crispy on both sides. Chop up the mushrooms, onions, and garlic. Heat up some oil in the pan (Use a pan that’s just a little smaller than the size of your plate. This is important for the egg.) to medium low. Once the oil is hot, add the vegetables with 2 teaspoons of the ketchup and 2 teaspoons of the soy sauce. Once the onion becomes clear, add in the rice, and the rest of the ketchup and soy sauce. Mix everything together. Once the rice is hot and thoroughly mixed with the other ingredients, put it all in a bowl and set aside. Put a small amount of oil in the pan, and then pour the beaten eggs into the pan. Lift up the pan and tilt it around in a circle so that the egg covers all sides of the pan. Let the egg cook, occasionally lifting up the egg from the sides of the pan to make sure it doesn’t stick. If you can manage it, flip the egg sheet over to cook on the other side. If you can’t, then just turn the heat down to low and wait for the egg to cook all the way through. Once the egg sheet is cooked, place it onto your plate. Move it so it is only on one-half of the plate (it should be falling off the edge. Just fold it over or roll that part up for the time being). Place the rice in the middle of the plate, over a bit of the egg sheet. Then fold the egg sheet over the top of the rice, and tuck it under the other side of the rice. Put some ketchup on your finished omurice if you’d like. Whisk together eggs, dashi, oil, and salt. Add cabbage and scallion; gentle fold both into the batter using a mixing spoon or silicone spatula. Generously coat the bottom of a large frying pan with oil and set on medium-high. Once the oil is hot and glistening, ladle the batter into the pan as you would regular pancakes. Cook for about 3 minutes, until golden brown on one side; flip and repeat. Serve warm pancakes with okonomiyaki sauce slathered on and drizzled with Japanese mayo. Sprinkle with katsuobushi or scallions if you want. Just about anything else you might want! Once the rice is clean, add in 3 cups of water and the salt and let the rice soak for at least 30 minutes. Bring the rice to a boil over medium-high heat, and then turn the down the heat to low and cook, covered by a lid, for 30 minutes. After that, turn off the heat, and let the rice sit for 10 more minutes. Pour/scoop into a bowl, and top with whatever you want! For eggs, I suggest poaching the egg in hot water first, but not for too long if you like the yolk runny. Soak kombu and shiitakes in water for 20 minutes. Place on medium heat and bring to a rolling simmer. Reduce heat and keep at a low simmer for 4 minutes. Remove from heat and take out the seaweed and mushrooms. Bechamel Sauce: A Versatile All-Star! Students often have a limited budget and limited time that can be allotted to cooking. Perhaps it’s because of this that we convince ourselves we have to make do. We buy nearly everything canned or in jars, including our pasta sauces. And while there’s nothing wrong with that jar of Alfredo sauce in the fridge, it’s possible to do much better while remaining on a budget, as well as using up our ingredients before they go bad. For example, milk goes fast and is cheaper to buy bagged, so why not make use of the leftover milk before you have to pour it all out? Got leftover cheese you need to use up? Or maybe just feel like going fancy and getting cheese for a nice dinner? This sauce is always there for you regardless of the occasion. It’s incredibly versatile. Add the flour and stir until smooth. Cook until the mix looks golden. *Tip: Don’t leave any lumps of flour in the mixture. You can go darker in terms of colour, depending on preference. Just be careful not burn the butter and flour mixture. Add in the milk and stir with a whisk. Keep cooking over the heat until the mixture boils, then cook for 10 more minutes. Whisk constantly. If you’re just looking for Bechamel sauce, stop here. Turn off the element and whisk in the Parmesan or Asiago in stages until well integrated. Turn off the element and whisk in a bit of all cheese types until well integrated into the sauce. Cook any type of pasta you want according to package instruction, add the delicious sauce that you made, and enjoy! Who said spring roll wrappers are the only option for an Asian, food loving, vegetarian cooking at home? To vegetarians the egg-rolls on the menu are to be avoided, all because they are likely to have meat inside, and yet the egg-roll wrappers are less expensive than their veggie counterparts. Here’s a way to turn the egg-roll wrappers you find in your local grocery stores to delicious vegetarian delights. Heat the oil in a pot, then add the filling ingredients of your choice. Fry for about 2 minutes, stirring constantly. Add the dipping sauce ingredients and cook for an additional 10-12 minutes or until sauce caramelizes, stirring occasionally. Meanwhile, take a small pot and fill with enough oil to be able to cover your egg-rolls plus some. Make sure the pot is tall enough that if oil was to jump – which it likely will – it will not splash all over the place. Heat oil until you can see wrinkles forming inside. Turn off the heat from your veggies and grab a sieve, placing it over a big heat-safe bowl. Pour the sauce and veggies mixture into your sieve and pat down using a spoon to help separate the two. While the sauce drains, prepare a little bowl or container with a mixture of cornstarch and water. Get a single egg-roll wrapper and place it in a diamond orientation before you. Next, using your finger, wet the boarder of the wrapper with the cornstarch water all the way around. Now, place some of the filling into the wrapper and fold as shown below: first taking in the two side corners, then the top corner, and rolling down until fully closed. Do not over-fill or under-fill your egg-rolls. Use up all the filling if you can. Prepare a plate with a paper towel on it to soak up the oil from the cooked egg-rolls. Drop the egg-rolls into the heated oil one batch at a time. The batch size will depend on the size of your prepared pot. Wait until the egg-rolls floats up to the top of the oil and are nicely browned before removing from oil and placing on the prepared plate. Finally, take the dipping sauce and place it in a container that is easy to dip from. Place that container with your egg-rolls on a plate and serve immediately. Now, for the last step: Enjoy! If you would like to make these egg tarts yourself, I would recommend you give yourself sufficient time since there is a lot of waiting in between steps. This was quite a lengthy and strenuous endeavor. Here’s a brief walkthrough of the process with measurements from the original recipe. You can adjust accordingly depending on how many you want to make. The first step is to make the “butter” dough portion of the puff pastry that your custard filling is going to sit in. Start by combining the flour and butter (cut into small cubes) together until you have smooth uniform dough. Make sure that the butter is cold. It should be coarse and flaky to begin with, but as you work more with the dough, the two will incorporate nicely. When you’re satisfied with the consistency, flatten the dough into a square about a ½” thick, wrap it in plastic wrap, and chill in the refrigerator. The next step is to make the “water” dough. Separate your two eggs but set aside the egg whites for the filling and add the yolks to the flour. The cold water should be added gradually to the mix since too much would make your dough too sticky. When you feel that everything is evenly combined, it’s time to roll out the dough. Sprinkle some flour onto a work surface to avoid sticking and roll out the dough to about a ¼” thickness. It should be laid out in a diamond formation and be big enough to encase the butter dough from before. After this, take the butter dough out of the fridge and wrap it up in the rolled out dough. At this point you’ll begin the rolling and folding process three times. Firstly, roll out the dough to a ¼” long rectangle and fold it into thirds. Cover with plastic wrap and refrigerate for fifteen minutes. Then roll it out again, fold it into quarters and refrigerate for another fifteen minutes. Repeat the previous step one last time and your dough should be ready for cutting. In summary, roll and fold in a 3-4-4 sequence. In between rolling and waiting for the dough to chill, you can prepare the custard filling. Create a simple syrup by melting the sugar in the water using a microwave and stir well to combine. Set this aside to cool since it will cook your eggs if you add this in right away. Next, mix together three eggs, the egg whites that were reserved from the dough, milk, and some vanilla extract. Feel free to adjust the amount of vanilla extract that you add. Since I baked my egg tarts in batches, I noticed that they were not as sweet as I would have liked and added a little more to my unused custard to supplement. Add your syrup to the rest of the custard after it has cooled and run everything through a strainer to remove any unincorporated egg whites and undissolved sugar. At this point, your dough should be nicely chilled so roll it out one last time to a ¼” thickness and use a circular cutter that has a similar diameter as your baking molds (I used a cupcake tray) and cut out circles of your dough. Grease your molds with a bit of melted butter. Lay the dough over the mold, press into the middle and using your thumbs, slowly work your way around the mold pressing the dough up along the sides of the mold. Using a fork, gently prick the bottom of the tart to prevent the dough from puffing up during cooking. When the tarts are ready, pour the custard filling into the cups and they’re ready to bake! The oven needs to be preheated to 400°F and the tarts will bake for about 25 to 35 minutes. Keep an eye out for the custard browning at the top; they should be a light golden colour, not dark. My adjusted recipe made around 60 tarts even though I intended to make only 24. The recipe is suited to making larger egg tarts so keep that in mind when playing around the ratios and adjusting the recipe. These tarts were most definitely worth all the work and the process of rolling out the chilled dough was quite the workout. The hard work assuaged the guilt from eating way too many of these after they were done. Good luck, and happy baking! ‘Egg’cellent Cooking Class at Sobeys! On the afternoon of March 1st, Noelle Kan and Angelo Gabriel de Asis of the UW Cooking Club held a cooking class at the Sobeys on Columbia/Fischer-Hallman. The cost of this event was a mere $10, to cover the use of the room, ingredients, equipment, and of course, the end result (which was delicious). The featured ingredient was — you guessed it — eggs! There were around eight of us who showed up to the event, so we were split into two groups of four to concoct our masterpieces: devilled eggs, eggs Benedict, and meringue cookies. Here’s a little tidbit about my inspiration to come to this class. In my first year in residence at Waterloo (UWP), I was watching my roommate cook an omelette. But she added another crazy ingredient to the mix: mashed banana! It sounded bizarre to me, but I eventually tried it. The omelette had this amazing sweet flavour when cooked. Ever since then, I have loved experimenting with eggs. When I saw the Facebook post about this particular cooking class, I jumped at the chance to learn more ways to use eggs in a variety of dishes. When we turned the bowl upside down, nothing started sliding out of the bowl — that’s how firm the mixture was. This process took about 10 minutes. Once the egg whites and sugar were thoroughly mixed, Angelo had us use a piping bag (plastic bag with the corner tip cut off) to make the cookies look like little Hershey kisses on a baking sheet. Once all of the mixture was used up, we placed the cookies in the oven for about 1 hour at 200 degrees F. The cookie itself was crispy on the outside, but once broken, its center had a soft texture. For the devilled eggs, our group filled a saucepan with cold water, completely submerged four eggs into the water, and waited for the water to come to a rolling boil. Afterwards, we turned the heat back down to let it simmer for one minute. We then took the saucepan off the heat and allowed the eggs to cool for 14 minutes. As you can probably tell, a lot of this recipe involved waiting! Finally, we took the eggs out of the saucepan, cracked them against a hard surface, and carefully peeled them under running cold water. Unfortunately, my egg was beginning to break as I was peeling off the shell, but it managed to hold its form! Once peeled, we cut our eggs in half lengthwise, scooped out the yolk, and mashed it with several ingredients: mustard, mayonnaise, salt, and pepper. We then put the mixture back into the egg whites. Note: sprinkling a bit of paprika on top also gives the egg an extra kick of flavour! 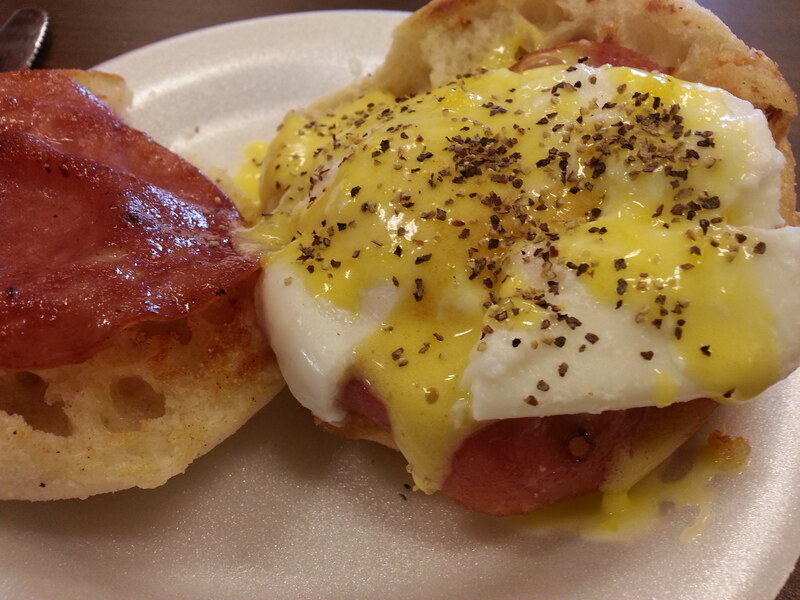 The final dish we made was eggs Benedict with Hollandaise sauce. This dish took the least amount of waiting, which was a bonus for all of us. Our group filled a saucepan with water, brought it to a boil for a minute or so, then reduced it to a simmer and added vinegar, which helps the egg cook faster. We then cracked an egg into a separate glass bowl. Here’s the tricky part: we used a slotted spoon and had to create a swirling ‘vortex’ motion with the water, and then carefully slip the egg into the saucepan. While the egg was being ‘poached’, we used a small pan to fry up the ham and toast the English muffins. After only 4 minutes, the egg was ready to be taken out of the water. The Hollandaise Sauce was definitely a highlight of this dish: all you need are four egg yolks, 1/2 a cup of unsalted butter, melted, lemon juice, and salt/pepper to taste. In a small mixing bowl, we combined all of these ingredients together and placed the bowl on top of the heated saucepan (you can also use an actual double boiler). The trick here is to keep working the mixture, placing it on-and-off the heat multiple times. The mixture should have a thick, creamy consistency, but not enough that it will look like scrambled eggs. Thank you UW Cooking Club for organizing this. I look forward to some more surprises throughout the term!